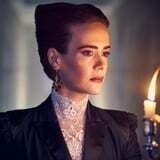 Now that the American Horror Story premiere delivered the apocalypse promised in the trailer, we're at the edge of our seats, wondering what might happen next. Our wild cast of characters are already going crazy after 18 months in Outpost Three, and the powers in place are quite mysterious and menacing. We'll have to save Ms. Mead (Kathy Bates) for another time, because right now all eyes are on the shelter's obvious big bad dragon lady: Ms. Venable. Sure, Wilhemina is, in the simplest terms, a masochist, but there's one thing she said in the premiere that makes us think she may be something else: a witch. Yeah, that's right. I'm getting the feeling that Ms. Venable used to run a coven . . . and her subjects were all male witches. When Timothy and Emily first arrive at Outpost Three, she tells them a pretty particular fact about the space. "For many years," she says, "it was an exclusive boys' school." Does that sound familiar to anyone? It sounds an awful lot like Miss Robichaux's Academy For Exceptional Young Ladies, which is the front for the witch school in New Orleans run by Cordelia Foxx. There's more evidence to suggest as much: I mean, this is a Coven crossover season, and this creepy, underground structure would certainly be a good space to foster the powers of young boys. But wait! There's more! If you look back at the 30-second preview - it was only meant to get us excited about the full-length trailer - there's a flash of a moment when Cordelia, Myrtle, and Zoe seem to be entering the outpost. But if you look behind them, you'll see a group of men all dressed identically . . . in rather colonial garb. Could these be the boys of the coven? Could Michael Langdon, who we know is the Antichrist and son of Tate and Vivien, be one of them? It all certainly seems possible, doesn't it? All we have right now are a few stray pieces of evidence. But rest assured, all will come to light in the weeks that lie ahead.